From a traditional concert cycle performed over 12 hours to a contemporary, comic take on wedding traditions, Kalaa Utsavam - Indian Festival of Arts presents the best of Indian art forms old and new this month. Held from Nov 17 to 26, this is the 16th edition of the annual festival presented by Esplanade - Theatres on the Bay. It is sponsored by Singapore Press Holdings under the SPH Gift of Music series. Since its debut in 2002, Kalaa Utsavam has gone beyond a showcase of musical headliners from Bollywood and more to also offering a platform for diverse practitioners of Indian art forms. This year's festival opens with a marquee name from India: Khwaab-Sa - Shakespeare's A Midsummer Night's Dream, presented by award-winning director Atul Kumar and The Company Theatre. The other headliner is Anjaneyam - Hanuman's Ramayana, a retelling of the Ramayana through Javanese and Indian dance. It features 50 dancers and 18 musicians and is led by Singaporean troupe Apsaras Arts in collaboration with Era Dance Theatre (Singapore), Kalakshetra Repertory Theatre (India) and Bimo Dance Theatre (Indonesia). Aravinth Kumarasamy, 51, artistic director of 40-year-old Apsaras Arts, says the troupe could not stage such an epic production without the backing of, and groundwork laid by, Esplanade's Kalaa Utsavam. "It has been critical for our growth," he says. Apsaras Arts has worked with the Esplanade since 2006, starting with smaller shows at the 220-seat Esplanade Studio. The troupe staged its first large-scale production at Kalaa Utsavam 2013 - the dance production Angkor: An Untold Story at the 1,950-seat Esplanade Theatre. Angkor received rave reviews and toured Asia. Kumarasamy is so confident Anjaneyam will also go on tour that he ensured the sets are small enough to fit into six sleeping bags. Multimedia visuals are mapped onto big screens to create a palace, a jungle or other locations in the Ramayana. "At our first performance at the Esplanade Studio years ago, I could recognise everyone in the audience," he says. "Now we are at the Esplanade Theatre and practically sold out. That's the following platforms like Kalaa Utsavam and the Esplanade's Raga series give you." 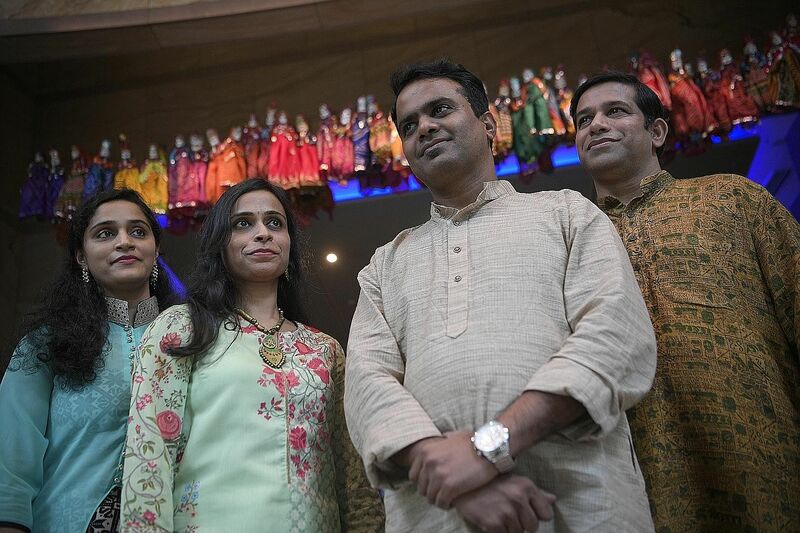 The Esplanade also programmes Indian art forms under its year-round Raga series. Taking Singaporean art groups to the next level is a key aim for the programmers of Kalaa Utsavam. Ms Rajeswari Ramachandran, producer at The Esplanade Co, says the festival's initial years featured artistic legends and Bollywood names, since not many presenters brought these acts into Singapore. Now that other impresarios tend to bring in headliners, the Esplanade thinks differently for Kalaa Utsavam. It features art forms rarely seen in Singapore, such as the Unesco-recognised dance koodiyattam, performed by Indian dancer Kapila Venu on Nov 18 and 19. On the indie side, Bangalore-based band Agam will perform their first full-length concert outside India on Nov 25 at the Esplanade Concert Hall. Agam fuse Carnatic melodies with rock music and were first seen here in the 2013 Kalaa Utsavam at a free performance at Esplanade's Outdoor Theatre. Singaporean artists commissioned for this festival include noted percussionist Mohamed Noor, who performs with three bands on Nov 19. Dance troupe Chowk Productions brings the sights and sounds of Howrah railway station from Kolkata to the Esplanade Theatre Studio on Nov 24 and 25. Unusual shows this year include stand-up comic Sharul Channa's take on Indian wedding traditions in Sharul Weds Sharul on Nov 18 (see story below). Then there is Chakra-thon, a series of seven free concerts held at different spaces around the Esplanade on Nov 18 from 9.30am. The singers and musicians will perform ragas, or musical scales, that are specific to the time and season. A morning raga would set a calm mood, for example, while an afternoon raga would be more passionate and energetic. Singer Pratima Bellave, 37, grew up changing her tune according to the time of day and year. "I tried singing Malhar hoping for rain," she says, referring to a raga specific to the rainy season. "But the sun came out and my father joked I hadn't sung properly." It is common in India to have a "marathon" series of raga performances in the day, but Chakra-thon is a first for Singapore. As a result of the tradition of time-specific music, concerts of classical Indian music here tend to feature evening ragas, such as the ticketed Raga Tarangini - Melodic Moods Of The Night on Nov 18, featuring Grammy Award-winning musician Pandit Vishwa Mohan Bhatt. Chakra-thon, however, will let audiences enjoy a greater variety of traditional music, says tabla player Nawaz Mirajkar, who leads the line-up for the free concerts. The 41-year-old adds: "In Indian music, there is a different raga for every hour. The music has a different effect on your body and soul. "As musicians, we feel the difference. We will present a few and you can see the effect on yourself and your thinking."